The creators of the popular Cover lock screen app for Android have announced that as of April 7, they are now employed by Twitter. 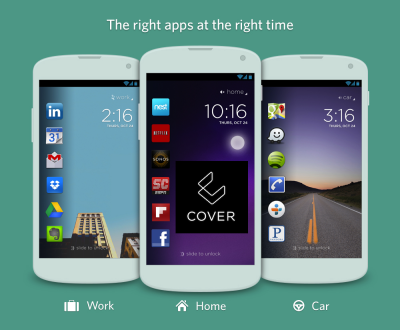 Unlike the regular lock screen that displays a limited amount of information (weather, time, etc), Cover provides quick access to actual applications in an intelligent way. Much like other Android apps that affect the Android home screen, Cover collects information regarding which apps you access at what time and then places them on the lock screen. This move obviously suggests that Twitter is at least contemplating how it can integrate into Android devices in a more pronounced way. Cover’s developers, Gordon Luk, Todd Jackson, and Edward Ho, are only handing over Cover and its development team. Therefore, it will be very interesting to see what Twitter does with the acquisition. Based upon the information that was provided in the announcement, the possibility for Cover to be changed or removed from the Google Play store is present. However, for the time being, people will still be able to download the application. Facebook famously attempted to create its own phone and/or phone OS, with the assumption that people primarily want to check up on their social networks. As we saw with those plans, people are not particularly interested in opening their phone and immediately seeing feeds, so hopefully Twitter doesn’t head down the same road. Question – What is Twitter planning to do with the acquisition of Cover? Summary: Twitter has acquired Cover, a lock screen application for Android. Cover allows people to access apps quickly but Twitter’s plans for it are still hidden.